Some things in life just take longer than they should. 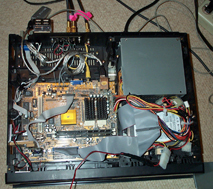 I started this project quite a while ago when I picked up a FlexATX motherboard from an internet surplus dealer. The concept was simple. 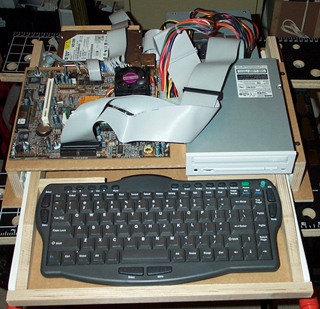 Build an extremely cheap computer, make it as compact as possible, treat it like a console device (like a CD player for instance), place my entire music collection on a hard disk in MP3 format, and place the unit in the bedroom so I can listen to my favorite tunes. From the outset, there were a few obvious challenges. My ideal box would be standalone; it would not require a TV or monitor for video output. Ideally, it wouldn't need a keyboard either since those take up too much space. It had to have built-in amplifiers so that I wouldn't need a seperate stereo amplifier. And it had to boot quickly and be silent. And let's not forget that it had to be dirt cheap. As luck would have it, I just didn't have the time to work on this thing. When I finally made some headway in early 2004, the results were dissapointing. Here are two pictures of what I came up with; one with the drawer closed and the other with the drawer open. I liked the drawer idea for the keyboard but the entire case was just too bulky. Not shown is the rest of the box, which rose a few more inches to enclose all the hardware. Made of MDF, the case was heavy and ugly. The straw that broke the camel's back was the hum in the amplifiers I installed (also not shown). Back to the drawing board. If there's one nice thing about old VCRs, it's that they are fairly deep. 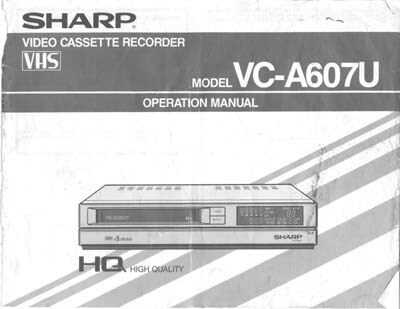 I had a 15 year old Sharp VC-A607U whose belts finally bid farewell last year. A little measuring confirmed that I could fit my FlexATX system into this plastic case if I was willing to strip my system requirements to the barebones. Given how long I'd spent on this project (I hate having stuff sitting about half-finished) any compromise seemed like a good idea. The new console will start out as nothing more than a computer. It'll have a single hard disk, a power supply and motherboard. The keyboard is wireless (infrared) so it's not tethered to the box. That's pretty much it ! Anything else I may add to the box will depend entirely on the available space in the box. For expansion, there will be at least one exposed USB connection for either a wireless network adapter or mass storage device. Of course, the entire unit needs to be cheap; otherwise I'd just buy an iPod and be done ! The simple truth is that the single most expensive item here should be the hard disk drives. Everything else is either recycled, taken from my spare parts bin, old/used "stuff" or obtained at a steep discount. Here's the bill of materials. PNY 128 Mb and 64Mb PC133 memory (total of 196 Mb) $0; New, free-after-rebate from CompUSA and Staples. From my spare parts bin. The total cost comes out to about $91, not counting miscellaneous hardware. Now for a quick look at the guts of this system. The ECS motherboard I'm using has several features that made it an ideal candidate for my console. It has a built-in wireless keyboard interface so there's no umbilical cord dragging about a keyboard. The FlexATX form factor is smaller than microATX through bigger than mini-ITX. The price was great, especially since it included the mid-sized keyboard. Since I don't meed a lot of CPU power, a socket-370 processor gives me lower power dissipation and therefore less fan noise than a faster more modern CPU. Integrated graphics, network and sound removes the need for add-in cards thus keeping the height down to a minimum. The TV-out feature means I can drive a standard television and don't need a computer monitor - perfect for use next to a TV. In short, I couldn't ask for a more suitable motherboard for the money. 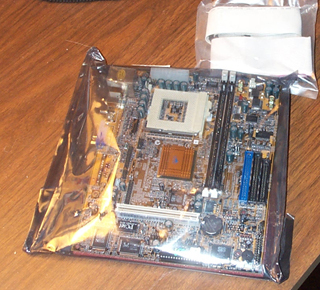 On the down side, the particular version of this ECS motherboard didn't have the audio I/O connectors installed on the motherboard (the audio chip is there, just no connector) so I had to wire them up seperately; not that big a deal. An 800 MHz (6.0 x 133FSB) CPU is more than enough power for decoding MP3 files. To reduce power consumption and heat, I can underclock the processor in the BIOS by running the front side bus at 66 or 100 MHz. Cooling the CPU requires two parts - a socket-370 heatsink and a fan. The heatsink is nothing special. The fan is a squirrel cage slot fan (photo left) with the I/O bracket removed. It is mounted to the underside of the case lid with double-sided foam (photo right). 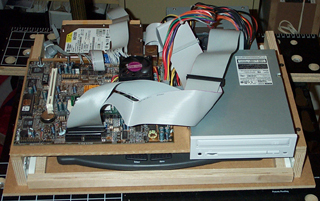 The exhaust blows over the disk drive and the power supply heatsinks. To reduce noise, a 33 ohm 1/2 watt resistor is added to reduce the voltage from 12V to 8.5V. After gutting the VCR of its internal components (photo left), I removed most of the plastic obstacles with a Dremel tool (photo right). The differences in the photos are subtle. The most obvious change is the removal of a wall 2/3 of the way back on the left half of the box. I left some of the plastic in place to help stiffen the box. The resulting unit contained two basic areas. 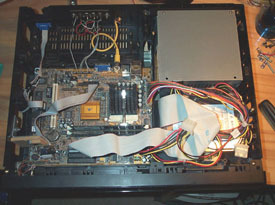 The motherboard sits on the left and towards the front. I would have liked to push it back further but it just didn't fit that well back there. Furthermore, the ATX power cable would be trickier to install without removing more of the plastic ribbing. The power supply and disk drive sit on the right side. On the front, I mounted a push-button on/off switch behind the flip-down access panel. Inside, I mounted a green power-on LED and the IR keyboard sensor. The original door for the VHS tape well has not been installed yet. This gives me easy access to the secondary IDE connector which I still need to hook up a CD-ROM drive - it's still the easiest way to get data on and off the unit. Over the years, I've collected a number of ATX power supplies. Frankly, I don't even remember where each one came from. I picked one that had enough empty space that I could cut about 3/4 inch off the sides of the sheet metal. I relocated the output cable bundle down in the new shorter housing. 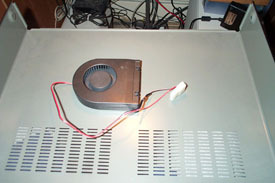 A 60 mm Panaflow fan replaced the original 80mm unit. The fan is mounted with two screws and seperated from the plastic case by Mortite weatherstriping caulk. To further reduce noise, a 50 ohm, 12 watt pot is installed on the rear panel to give me control over the fan speed. Maximum attenuation would yield a voltage of only 6.2V instead of the normal 12V. The original power supply had a 115V/230V switch. It is now hardwired to 115VAC. An input IEC 3-prong power connector and switch are added to the back panel. The single 3-1/2 inch disk drive is mounted on two wooden slats. The slats are then mounted to the bottom of the case. This is a lot easier than trying to align screws from the bottom of the chassis directly into the disk drive. A small rubber grommet isolates the drive from the wood slat at each screw to reduce vibration transmission. 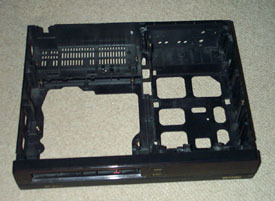 The motherboard rests on several raised plastic supports. These were originally used to support the VCR's PCBs. I used a Dremel to level these posts to the same height. Only two screws hold the motherboard in place. 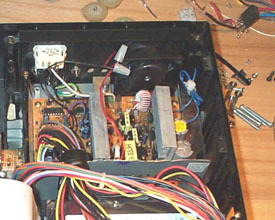 The power supply is held in place with three small bolts. 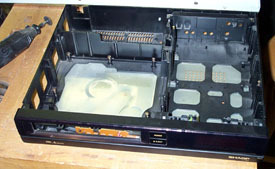 In the rear panel, audio line-in and line-out connectors are mounted (photo left). Both 1/8 inch stereo and RCA connectors are used. I wanted the option of using a Cirque Glidepad instead of that little rubber eraser mouse on the keyboard so I installed a 9-pin serial connector to a header on the motherboard. This required re-working a ribbon cable. Finally, a single RCA jack provides NTSC video output. There is no VGA connector. The photo on the right shows the final layout of the three main parts - motherboard, power supply and hard disk drive. With the main computer built, I turned my attention to expansion capabilities. With the limitations imposed by the size of the box and the motherboard used, my only option was USB. For networking, I used a Netgear WiFi USB dongle. Any other expansion needs would be attached via a 4-in-1 USB hub. The hub is glued to the rear of the unit with double sided sticky foam. Cables for both the hub and the WiFi dongle are coiled and left inside the chassis. The picture on the left shows the addition of the USB cables towards the top of the picture. The picture on the right shows the position of the USB hub on the back panel with ports facing up. The motherboard audio chip is connected to the output solder pads via the J7 header. My motherboard did not have the standard 1/8 inch audio connectors installed on these pads thus the jumpers from the audio chip were not installed by default. Insert jumpers on pins 3-4, 5-6 and 7-8 of header J7 to enable the audio chip. For the record, this little contraption did work for a while. I had it hooked up to a little 12 inch TV and it worked quite well. I never did get around to creating a user interface that I wanted; the popular software media players are all aimed at displaying idiotic album cover and other useless non-audio related junk. As luck would have it, the power supply fried itself one day. Really! It just went up in smoke all by itself. I didn't have another ATX PSU that would fit the chassis and finding another on the market would be impractical so I shelved the project. Besides little media players are some prevalent today that this console makes little sense. At one point, I used a portable DVD player to play MP3s burned onto DVD-RW - you can pack tons of music in very little space. I do have plans for the ECS motherboard however. I smell a FreeNAS box in the air.